Sometimes a poorly advertised sleeper film sneaks up and delights you when you give it a chance. This is not one of those times. Sleight, a more-or-less independent film, opened in theaters last week and it failed to say much about the potential of these non-blockbusters. While a fresh(ish) story to be sure and a great performance done by the still relatively unknown Jacob Latimore, the quality of some of the most key aspects of the film were so substandard that they couldn’t be forgiven. The story follows Bo (Jacob Latimore), an extremely gifted young street magician who turned away from his praised potential in electrical engineering in order to raise his little sister when their mother died. During the day Bo dazzles pedestrians with impossible card shows and miraculous coin tricks. What the pedestrians don’t know is that a fair amount of his tricks are aided by an invention of his that involve an electromagnet he imbedded in his arm. What they also don’t know is at night he sells drugs all over the city for an increasingly violent drug dealer named Angelo (Dule Hill). As Angelo presses Bo to be more involved in his criminal business Bo must decide if he should use his very specific skills to go down this rabbit hole, or use them to get out. The concept is inarguably intriguing. Like The Prestige meets Boyz n the Hood with a sprinkling of Iron Man. The execution, however, was performed poorer than Mary Queen of Scots’ (too soon?). It was hard to determine what exactly the worst part about the movie was, but we’re going to first look at the dialogue. It was written as if the writer had heard of human interactions, but had not actually experienced one himself. Not only were the words themselves clunky and unnatural, but the context in which all of them were said were uncomfortable. A first date scene in particular springs to mind. While those are naturally uncomfortable there was definitely a good bit of dialogue that was in there that would not normally be discussed on a first date, and was clearly only added as exposition. Another scene that was extra odd was when a character asked Bo to join her at the bar so she can share some good news. It took about ten minutes of screentime to get there, then the good news lasted two sentences. Why this had to be done at the bar was clearly because the writer just wanted them to move, not because it was organic. This leads me to the next major flaw in this movie, and it pains me to say it because I respect the hell out of several of them, but it’s the actors. Poorly written lines or not, a good actor committed to the role will make it work. These ones did not. With the exception of Jacob Latimore, everyone seemed to think this was a high school play, and since a lot of high school plays have that ONE actor that’s way more into it than everyone else, that’s actually a great analogy for this movie. Sasheer Zamata, a great actress, portrayed a one-dimensionally written concerned neighbor character. She gave it as much enthusiasm as one does in the written thoughts in their grandparent’s birthday card. 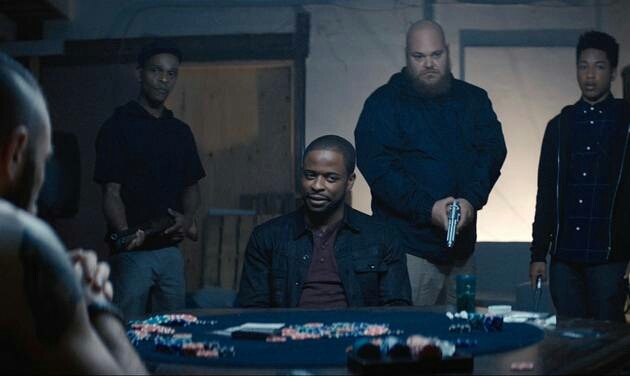 Dule Hill, veteran actor with a diverse background plays a violent drug-dealer. Anger doesn’t seem to come naturally to him however, and the scariest he got was concerned-sitcom-dad. One of the movie’s saving graces is that it’s very short. This too seemed to work against it though. At an hour and a half runtime, one would think they trimmed all the fat from the picture and it’s running lean on pure story fuel. This is not true. There are so many establishing shots and time wasted on montages that this movie probably could have been a TV movie, fitting into an hour slot with commercials. If this was a TV movie, it would have improved its rating. The effects of the movie were pretty cool, the main character seemed to be where all of the writing talent went, and if there was a sequel with a different writer, I’d watch it. As it is though, it would make a decent $1 rental movie when you have an hour and a half to kill. A theater piece? Pass.